Available at Etching House Dreaming Alice by Charles Blackman in a fine art rag mat print or a fine art archival Canvas print with an image size of 90x133cm, both are hand signed and come with a certificate of authenticity. 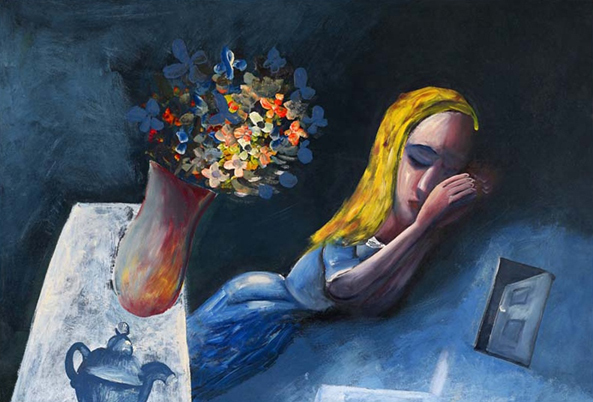 Dreaming Alice is a hand signed limited edition Archival pigment print on artist paper, it is of the original painting by Charles Blackman form 1956, this limited edition fine art print has a image size of 66 x 97 cm with a sheet paper size of 76 x 107 cm. Etching House offers up to 12 months lay buy on this fine art print titled Dreaming Alice. These Canvas prints are hand signed and come with a certifcate of authenticity. 12 months Lay Buy is available on 20% deposit at Etching House for these fine art Charles Balckman Master Works print series titled, The Presentation, Dreaming in the Street, The Blue Vase, Dream Image, The Drama, Metamorphosis.